Karen Engelmann’s The Stockholm Octavo was one of those books I pulled off a Barnes & Noble shelf at random because the cover art and the title caught my eye. The description was similarly intriguing and because I tend to have a good instinct about books, I bought it. Then it sat on my shelf for two and a half months. 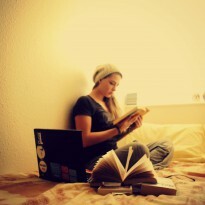 I do this a lot – buy books and then don’t read them for a while. It all depends on what I’m in the mood for. But if I see a book about turn-of-the-nineteenth-century Sweden, I have to have it, just in case I can’t find it again (absurd, I know). So I decided to read The Stockholm Octavo last week because I need a break from all the crime fiction and because we’re getting into the Christmas season and the next Hobbit movie is coming out soon, so there’s magic in the air and I just felt like a fairy tale. This was a good choice. 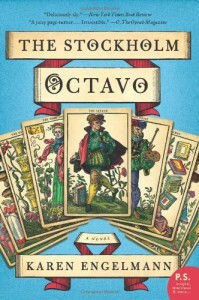 Engelmann’s Octavo is nothing if not an immersive read. It’s difficult not to get swept up in the blindingly colorful atmosphere of ‘the Town’ in the early 1790s. Octavo follows the intertwining paths of about a dozen different characters as they flit in and out of Emil Larsson’s life. Promised by a ‘Seer’ that the completion of his Octavo – a kind of fortune-telling card game – will lead to ‘love and connection,’ Larsson expects little more at the outset than a promotion and an advantageous marriage. What he gets is a treasonous plot to assassinate King Gustav III and task of rescuing him, a cross-dressing calligrapher and a pretty young apothecary from the clutches of the ambitious Madame Uzanne – a widow with a vengeance against Gustav and a master manipulator of that vital revolutionary accessory, the folding fan. What Engelmann does well is spin a web of intrigue that keeps pages turning, and tease the reader with just enough magic and mystery to tickle his imagination. That, and I have to admit, I love a good female villain who can play ball with the boys. It’s not something you see every day. Of course, Octavo has its problems, the foremost of which is that what each of Sweden’s political factions actually wants is never fully explained, so it’s hard to know whose side to be on. The climax is a trifle confusing, and the end strangely unsatisfying, possibly because it takes the story in quite a different direction than expected or was ever hinted at. That being said, I really enjoyed this book. It’s fanciful and enticing, but grounded in a real enough place that it doesn’t feel like reading fantasy. A good read, probably, for people who liked Harry Potter in their younger years and want a little taste of grown-up magic. Go out and buy it from a real bookstore! Or find it on Goodreads here.